The name Henry Morris is synonymous with apologetics, and the "father of the modern creationism movement" doesn't disappoint with this new title. 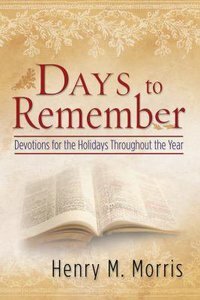 Drawing on his decades of Bible study, Morris tracks our most popular holidays, giving biblical insights into each. Study the rich heritage of our nation, along with biblical truths behind such holidays as Thanksgiving and Christmas. Dr. Morris has penned devotionals for many years, and has legions of fans, all of whom will appreciate the knowledge and love for the Creator fund in these pages. Dr. Henry Morris, with his copious writings about the creation/evolution debate, has earned the title "The Father of Modern Creationism." He is a respected scientist as well, and has written a number of textbooks in his own field. He is the founder and now president emeritus of the Institute for Creation Research in California.